A congressional committee chairman investigating allegations of delayed care and cooked books at Veterans Affairs health care facilities said the current revelations are "just the tip of the iceberg." Rep. Jeff Miller, a Florida Republican who heads the House Veterans Affairs panel, on Thursday forecast more serious developments. At 6:30pm ET, Reps. Joe Crowley (D-NY) and Tom Cole (R-OK) join Stephanie Cutter and Newt Gingrich for a debate. Who do you blame most for the VA scandal? Vote by tweeting Shinseki, Obama or Congress using #Crossfire or comment on our Facebook post. View results below or through our Poptip results page. Last time I was at the VA, I was instructed to use a patient scheduling "kiosk" to check in for a very serious medical procedure. I did so and it printed a coupon for 10% off some Nestles candy bar. WHY IS THE VA HOSPITAL SCHEDULING SYSTEM ADVERTISING CANDY BARS? Disabled veterans are dying because of mismanaged scheduling, while the hospital is using the same systems to advertise candy bars to cancer patients? What's next? Offering free 10% off burial coupons to the families of all the veterans they murder–as long as they buy a Frito-Lay branded casket at full price, and pay the Westborough Baptists Funeral Protesters to be pallbearers? I mean sure, it totally cheapens and disrespects veterans to walmart them into an early grave, plastered with dollar-store coupons, and being murdered by the very people assigned to care for them–but at least the government saves a few dollars. Besides everyone knows it's not murdering veterans that makes the VA money–it's the concessions! “Obama took too long to respond to the VA crisis” – here we go again with everything being Obama’s fault and that is just totally ridiculous. Like with the Swift-boat propaganda, the veterans are once again being exploited for propaganda and politics, which never solves any problems and only serves the purposes of some politicians. When are the people, the voters going to say “enough is enough” and demand that the right and the left “stop fighting and start fixing”. These self-serving politicians just totally concentrate on their politics and seek to aggressively criticize, to find fault and to use that for political advantage without any real effort to ever fix things. The right, with the strong backing of “the money”, is more organized, aggressive and with deeper pockets and are just more able to constantly be focused on arrogantly faulting and stubbornly blocking all real efforts but both sides need to become responsible in addressing problems with conscientious and honest cooperation and compromise – putting their politics aside to do the job. The only way we will ever see any real progress in that regard is when the people actually come to say “enough is enough” and firmly reject the propaganda insultingly intended to dupe, use and abuse them. When the voters refuse to be taken for granted and put their own prejudices, biases, exploited emotions and misplaced loyalties aside to avoid being manipulated, and then not only to reject the propaganda but also to totally reject the “puppet” politicians who serve only their own and “the money’s” interests, then and only then will we see more than just rhetoric aimed to excite and use us. “Stop the Fighting”, the self-serving politics, and “Start the Fixing”, conscientiously, responsibly and honestly doing the job – that is what we need and what they were elected to do … the point being that the people, the voters need to force them to do it. What will "He" choose ??? Intelligent minds want to know ??? It really isn’t “conservative” versus “liberal”, it isn’t about political philosophies or positions as those things are just used to excite and control the public. What it is about is power and with that power to gain substantial personal financial wealth. What is disgusting and totally offensive is that there are those who think they can simply con the people and manipulate public opinion, using propaganda and deception to play on people’s biases, prejudices, emotions, fears and loyalties, insultingly just taking for granted that they can dupe the people and simply use and abuse them by swaying them, like “pawns”, to literally vote as controlled. We saw this aggressive manipulation with the “conservative” Christian in 2000, with the Swift-boat propaganda in 2004, with the Tea Party movement in 2010 and now with the created excitement sought over the Obamacare, Benghazi and VA criticisms, always aimed to sway the voters in the same single direction. The obvious clue is that there never is anything offered to benefit the majority, to ever solve the problems, absolutely nothing, always just manipulation intended only to have gain in their political ambitions and to serve “the money’s” interests, for their strong support. The “puppet” politicians and “the money”, who “pull the strings”, display no conscience, only greed and arrogant and stubborn cockiness, as if somehow it is their right as self-appointed elitists. Bush-Cheney clearly demonstrated all of this as they used their offices and America’s resources for their private agenda to totally concentrate on serving “the money” and it cost the country, the tax payers, the majority greatly. If we truly ever want the return of a Grande Ole Party with a conscience for the people, then we need to reject what they have become, totally reject their propaganda aimed to control us and firmly and totally reject their “puppet” politicians, thereby breaking the stranglehold “the money” has on our politics and to just let all politicians know that the people have the power, so they better just concentrate on serving them. Who are under constant attack by, especially conservative lawmakers, the Representatives of the people who hired them, and those people like that, in hearings, in the press and the press, high paid taking heads love them tax cuts that came with these wars, continues the attacks, in the conservative veterans ranks and established, reactive never proactive, veterans organizations, conservative leaderships, as well, instead of doing their jobs, it's easier. Long time under funded as wars are cheered on with flags waving patriotism. Long ignored issues, way way too many and now being addressed finally under this present VA, by Veterans especially after returning from our wars, because it costs Sacrifice from the great majority served so their reps don't demand that Sacrifice, they like it that way. Free wars, these two present ones have yet to be paid for, and condemnation of Veterans, slackers and free loaders and more, when they seek the help promised by the Country. Decades long under funded agency, people served responsibility, that causes costly problems, in more ways then just from the treasury, thousands die while waiting for the promises, with the dedicated, no politics or self enrichment from most, brought to their dedication to the tasks they perform and are easy targets as well for those seeking to privatize government for corporate profits from the treasury and added fee's joining the numerous problems and greed found in that private sector! The question was asked about who is responsible for the VA problems? The answer is simple, those in charge that took our young people & put them in harms way in needless wars! I agree the Republicans put our troops in harms way for nothing. Then in February of this year. Sen. McConnell lead a fight against a VA bill that would help the veterans. 42 Republicans voted against the veterans. Republicans love to start wars but don't want to help those that fight the wars. When will voters get wise to Republicans. Looking for a lone villain in the VA debacle, however, is a fool's errand. It's true that—despite holding the world's most powerful post for five years—Obama is yet to eliminate the long waiting times for veterans seeking help. Blaming him alone, however, is to ignore roots of the problem that stretch back decades before Obama took the Oval Office. Instead, the sheen of shame over the VA's failures spreads across time and party affiliation. It stains the legacies of presidents as far back as John F. Kennedy and condemns past Congresses whose poor oversight allowed the problem to fester. 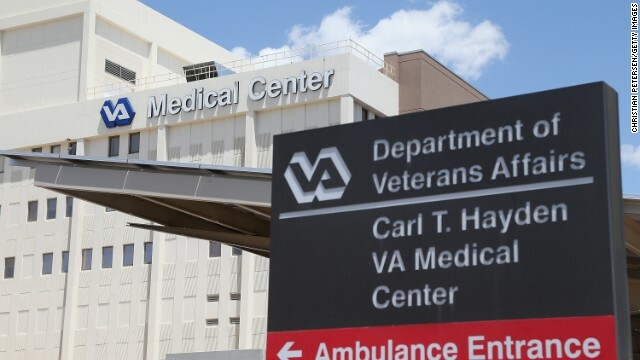 The VA itself is also not without fault, as bureaucracy and intransigence let the department deteriorate to the point the problem became nearly impossible to fix. So who really broke the VA? In sum, it's a failure with many silent fathers. Obama's experience with the VA is a testament to the danger of big promises—and high expectations. The administration made it easier for veterans to get compensation for both post-traumatic stress disorder and exposure to Agent Orange—a Vietnam War-era defoliant now tied to a long list of neurological disorders. Those moves extended help to long-suffering veterans, but they weren't matched by the VA reforms needed to adequately address the new claims. Agent Orange alone took up 37 percent of the Veterans Benefits Administration's claims-processing resources nationally from October 2010 to March 2012, according to a Government Accountability Office report. And as claims soared during Obama's first years in office, so did wait times. In 2009, there were about 423,000 claims at the VA, with 150,000 claims pending for more than four months (the official wait time it takes a claim to be considered "backlogged"). By 2012, claims had exploded to more than 883,000—and 586,540 of those sat on the VA's backlog list. The administration did request—and get from Congress—additional funding for the department. The VA's budget totaled $100 billion in 2009. In 2014, it was up to $154 billion. But that money doesn't instantly transfer into an expanded capacity to meet veterans' needs: It takes approximately two years to fully train a claims worker; the blame for the staff crunch doesn't rest on Obama's shoulders alone. "As a candidate, Barack Obama promised veterans the moon, but in many cases he hasn't delivered as president," said GOP Rep. Jeff Miller of Florida, the chairman of the House Veterans Affairs Committee. "VA's disability claims backlog grew to historic levels on his watch. … Candidate Obama promised the most transparent administration in history, but his VA is a case study in how to stonewall the press, the public, and Congress." Miller's own branch of government, however, cannot claim clean hands. The VA could be overhauled to better address the needs of modern veterans, including reforms to the way it processes claims, assesses the performance of its employees, and measures its overall performance. But putting many of those reforms in place would require an act of Congress—and thus far those haven't happened. Instead, Congress has taken a more reactive approach. When incidents—such as the recent hospital deaths—capture public attention, lawmakers hold hearings where they berate VA officials with juicy sound bites they can later play back for their constituents. It's good political theater, but it's unclear that the payoff is anything other than political. "Congress has been totally exasperated by the VA's inability to get on top of the problem for a long time," said Linda Bilmes, a senior lecturer in public policy at Harvard University's Kennedy School. "But they haven't been willing to really contemplate anything other than throwing more money at the problem." And even when Congress has passed legislation aimed at improving the department, its record of efficacy is mixed at best—especially in terms of eliminating the claims backlog. In 2000, lawmakers passed the Veterans Claims Assistance Act. The law was signed by President Clinton and was, by all accounts, a well-meaning attempt to make it easier for veterans to get VA claims approved. The law required that the VA tell a veteran what to do to prove a claim, help the veteran obtain necessary records, and inform the veteran when the VA could not obtain the information it needed. The law required the VA to retrieve the veteran's service medical records and provide exams when the VA did not have sufficient evidence to substantiate a claim. But the law was ambiguous and left much open to interpretation, which had to be fought out in the courts. It wound up adding several additional layers of bureaucracy to an already clunky VA claims process without appropriating additional funds or human resources to manage the increased workload. "So the situation wasn't getting better; it just added another forum that made it harder to get things done," said Sherman Gillums, an associate executive director with Paralyzed Veterans of America. "We attribute a lot of the early trouble—not the current backlog, but early trouble—to this, because it created an institutional laziness or institutional inefficiency and made that a part of the culture at the VA. People just accepted claims sitting around a long time because they had to do all of this other stuff. "So if there is a snowball in all of this, I would say that's the little tiny thing that would eventually become the avalanche," he said. The Bush administration sent troops to Iraq and Afghanistan, but when those troops came home injured, the Defense Department failed to adequately communicate it to the entity tasked with helping them. The underreporting made it more difficult for the VA to prepare for the coming influx of requests for help. The poor sharing of information—including medical records—between the two agencies has long been a bone of contention, and it remains a challenge (albeit one that is improving) to this day. "It's not surprising, really, that the VA ended up being poorly prepared for what happened, given the way that they were planning," said Harvard Kennedy School's Bilmes. "There was absolutely a lack of planning, a lack of capacity for planning. ... They didn't know what hit them. They were completely overwhelmed." Additionally, the VA's claims-processing time skyrocketed early in the Bush years. In 2002, it took the VA an average of 224 days to complete claims, as compared with 166 days in 1999. While the department was hampered by plenty of external factors, it is hardly an innocent victim. VA leadership allowed its problems to fester and its infrastructure to crumble. For example, the VA did not have a digital way to process claims nationwide until 2013, instead relying on an inefficient paper filing system. By comparison, the IRS rolled out its electronic filing system across the country—albeit with some problems—in 1990. It's just one area where the department was too slow to react to changes in the world around it. Even by the mid-2000s, several years after 9/11, the VA was using out-of-date claims projections it had based on injury estimates that used assumptions from older wars. Due to medical advances, many service members who would have died from their injuries in past wars are now being saved. That means fewer deaths, but it also means more wounded veterans, a development the department failed to anticipate and was slow to adapt to. And VA leaders at times failed to request the funding needed to do their duty. In 2005, under VA Secretary Jim Nicholson, after originally denying its fiscal predicament, it came out that the VA faced a $3 billion shortfall in funding for veterans health care. The situation required emergency supplemental funding from Congress. "There was a leadership attitude that was not aggressive in pushing back against whatever administration, … or even quietly going to Congress and saying we need more people," said Gerald Manar, national veterans service deputy director at the Veterans of Foreign Wars and a former 30-year VA employee. In many ways, the Obama administration is paying for the negligence of past administrations, dating all the way back to President John F. Kennedy, who authorized the decade-long use of Agent Orange in Vietnam. But it wasn't just Kennedy. Under President Johnson, Agent Orange was the dominant chemical used during the war. President Nixon halted its use, but a long line of presidents either refused to acknowledge the damage done or failed to address it. "Democrats and Republicans have allowed this festering sore to continue." President Carter's VA created the Agent Orange registry, where veterans who were worried about potential side effects could be examined. But four years later, a GAO report found that 55 percent of respondents felt that the VA's Agent Orange examinations either weren't thorough or they received little or no information on what long-term health impacts exposure could cause. And President Reagan's legacy includes a damning congressional report from 1990 that found: "The Reagan administration had adopted a legal strategy of refusing liability in military and civilian cases of contamination involving toxic chemicals and nuclear radiation. ... The Federal Government has suppressed or minimized findings of ill health effects among Vietnam veterans that could be linked to Agent Orange exposure." Progress has been slow. Vietnam veterans won a major victory under President George H.W. Bush when Congress passed legislation allowing the VA secretary to make certain diseases, including Hodgkin's disease and non-Hodgkin's lymphoma, "presumptive" to Agent Orange exposure. This means that the VA automatically assumes the diseases are related to the defoliant that the veterans encountered during their military service, making it easier for them to collect disability payments. The government's long-standing failure to address the damage done to veterans by Agent Orange mirrors the larger failure of the VA. It spans generations and party affiliations, and every effort to fix it comes with unintended consequences. "This goes across party lines," said Ronald Abrams, the joint executive director with the National Veterans Legal Services Program, and a former VA official who has worked on veterans claims cases for 40 years. "Democrats and Republicans have allowed this festering sore to continue." Coming Soon: What Would It Take to Really Fix the VA? Your so right, Nicholson was just on TV telling how bad the VA was when he was the leader. But the Republicans did nothing to help him try to fix the problems. Now under Obama, they blame Obama for all the issues that were alive and well under the Bush administration and they did NOTHING> Republicans are the biggest LIER and give out misinformation all the time. Republicans are the real TERRORIST of this nation. Who Really Broke Veterans Affairs? It stains the legacies of presidents as far back as John F. Kennedy.